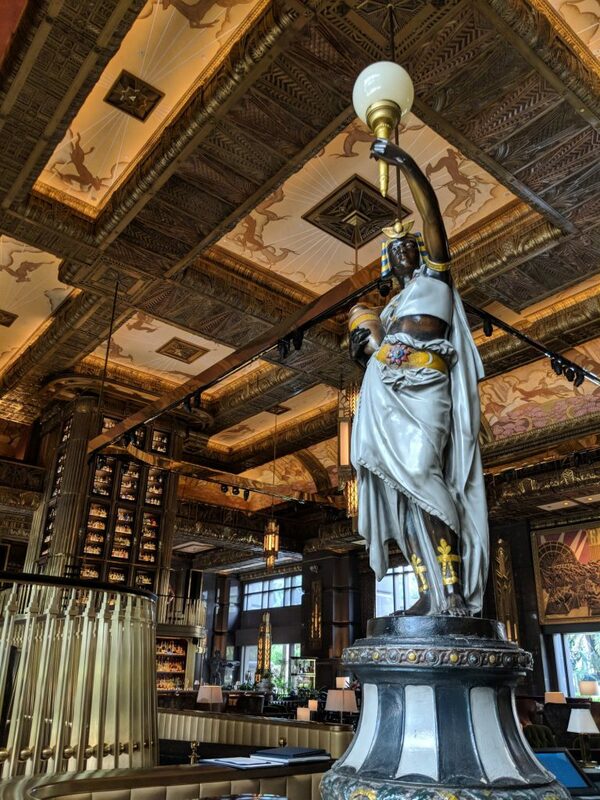 The Takeaway: Simply put – the most beautiful bar we have ever drunk at, with a museum of over 1,400 gins. It feels like drinking on a movie set, but its library-like atmosphere and austerity make it hard to have fun. Rare opportunity to have vintage gins. Ideal for gin connoisseurs or medium-sized groups. 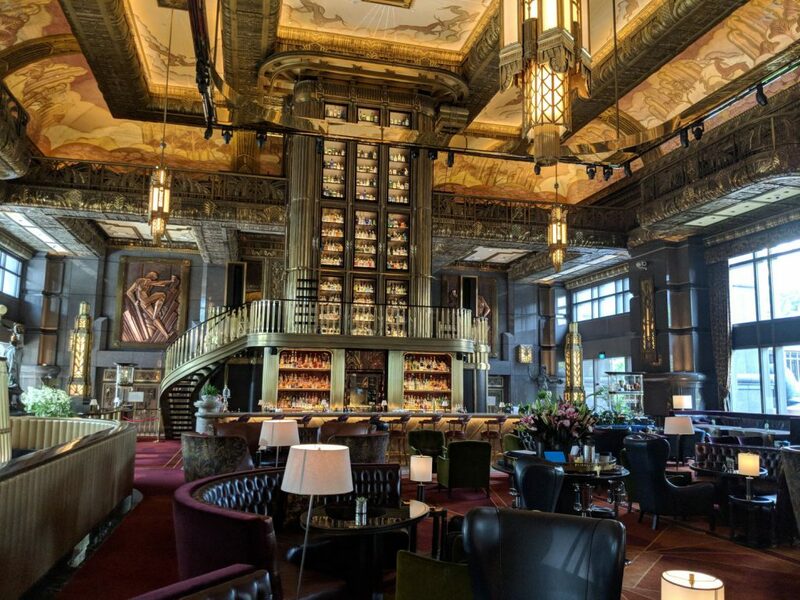 In the lobby of a golden building that looks like it should be the goblin-run “vault” of a fantasy film, Atlas is hands down the most gorgeous and architecturally impressive bar these two diplomats have yet explored. 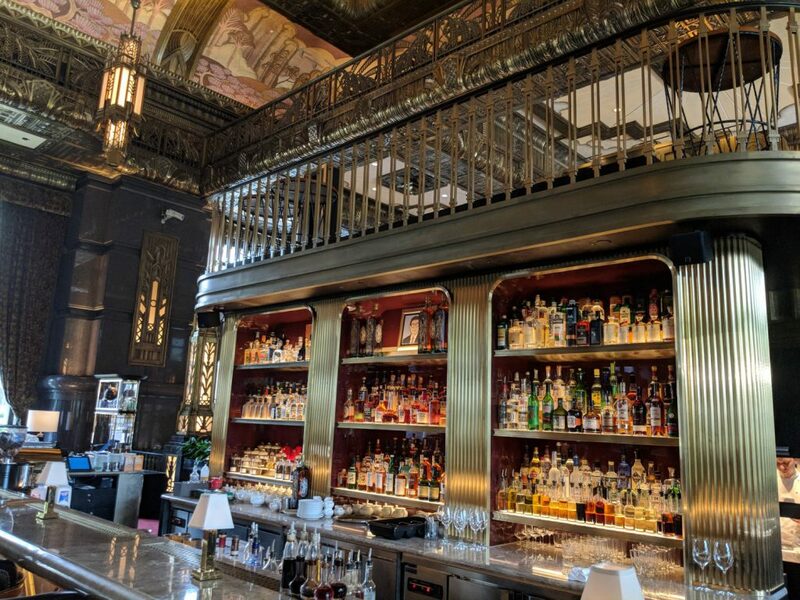 One end of the cavernous lobby houses a 3-story bar filled with over 1,400 gin bottles, with stairs winding around for access. 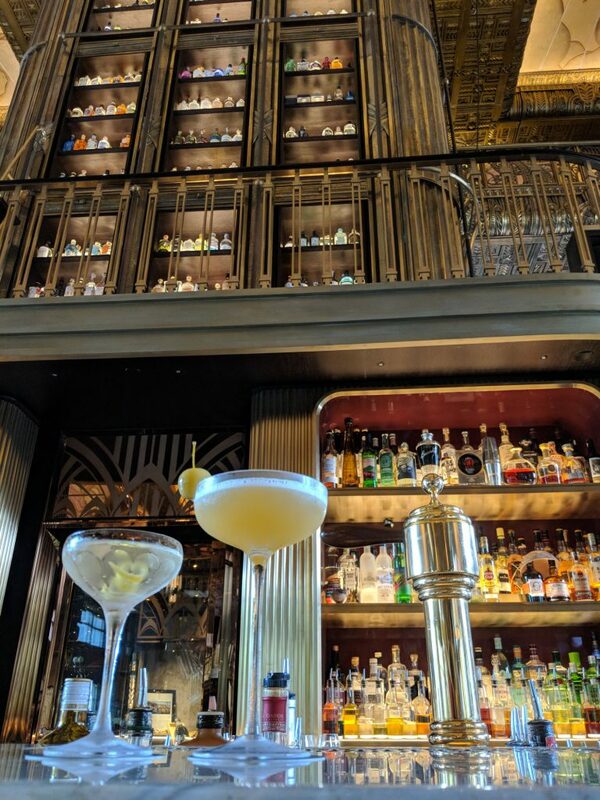 On the other end, what would pass as the full bar for any other top-tier cocktail establishment sits independently. Filling the gulf between the bars are suede plush couches, gilded and intricate bronze columns, and painted ceilings. Odd, gratingly peppy French music is piped throughout the expansive hall with singers crooning “boo doop bee doop bop”. We arrived around noon, just after the bar opened, and eagerly thumbed through the menu. Vintage gins from each decade (starting from the 1910s) are available, and even some cocktails made from vintage gins and vintage vermouths. Their specialties are martinis and gin & tonics. We ordered the namesake Atlas martini (very good – an easy sipper that is more “approachable” than a standard martini while not being too saccharine), a Dukes of gascony (an armagnac-based with a well-balanced hint of champagne vinegar funkiness), and a young Churchill (islay scotch with chocolate notes – and a chocolate garnish). 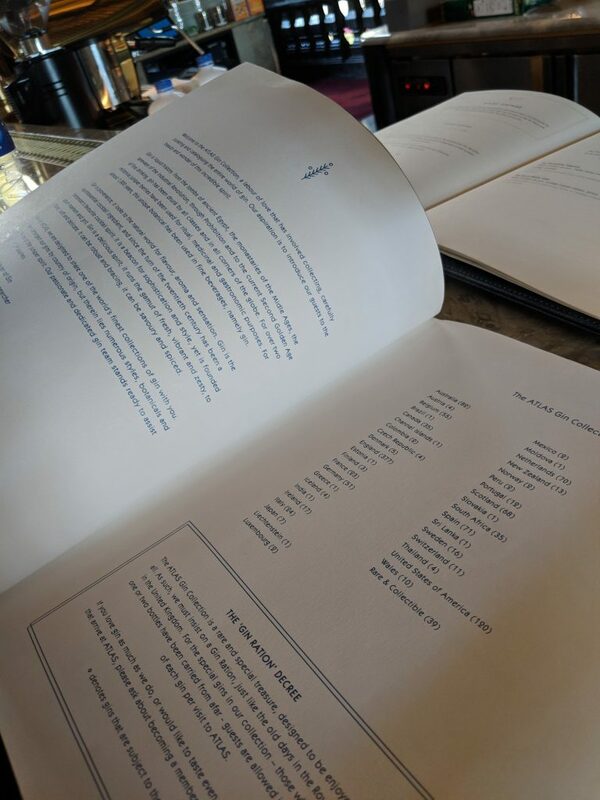 The gin list itself is an impressive compendium, with gins listed by country, and covering the globe. However, the price for admission is steep: many gins which retail for $30 / bottle in the US were ~$18-20 USD per pour. We ended up only trying the Singaporean brand Paper Lantern, who distills a Sichuan peppercorn gin. 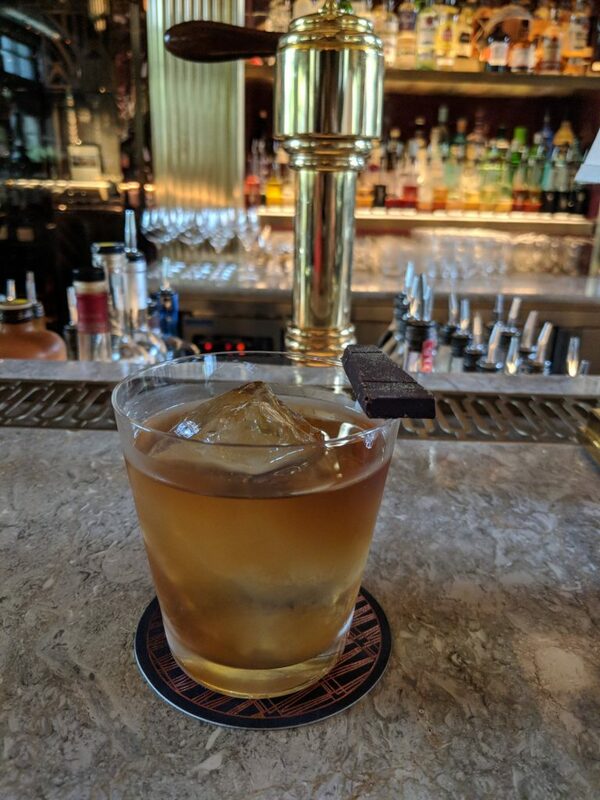 It ended up being a pleasant sipper, with a different botanical composition than anything we’d ever tasted, but with none of the characteristic numbing spiciness. Maybe the oils don’t survive distillation? For all its visual beauty, Atlas was a bit of a letdown in terms of a “bar” experience. We sat initially at the smaller bar and ordered from the bartender. He nodded and then moved to the other bar at the opposite end of the building, to fix the drinks. We eventually followed him there, where he placed the drinks in front of us without much flourish, then walked away back to the smaller bar. Other waitstaff walked around, nodding and smiling at us, but did not engage in chatter, and we were forced to sit silently evaluating the cocktails over the din of music that seemed to be crescendoing in its obnoxiousness every passing minute. Postscript: At one of our next bar outings, we talked about the terrible music at Atlas with a bartender, who mentioned another guest a few days ago complained about the same thing. He resolved to talk to his friends at Atlas to get the music changed – so cheers to hoping that the gorram music will improve in the near future.